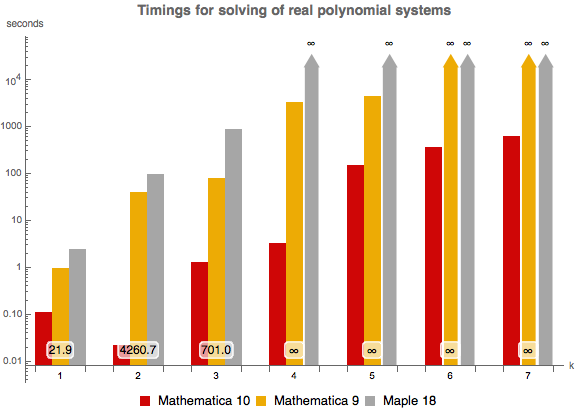 Mathematica 10 includes a new version of the cylindrical algebraic decomposition algorithm used for solving systems of real polynomial equations and inequalities. Shown are timings for finding the solution sets of , where , , , , , , , with the variables ordered . The experiment was performed on an Intel Xeon 3.07 GHz 64-bit Linux system, with a time limit of 36,000 seconds. The number at the bottom tells how many times faster Mathematica 10 is than Maple 18.